If you gaze upon a close-up of the cold staring eyes, the sweating and moist brows, and the nervous yet persistent twitch, scratch-scratch, you'll notice that all of this signify's that Hollywood is filming another casino scene. On average most casino's have the capacity to imbue a scene with a degree of intensity, simply because this brand of establishment manages to transform a script, or at least, a good script, with the power to indulge a scriptwriter's fiercest gambling desires: From the gentlemanly manner of a wealthy setting, as opposed to recreating the buzz through sites such as yourmobilecasinos.com. Now from the many films on offer, we, or should I say, one person in particular, have picked out three of the most intense casino scenes ever witnessed on the silver screen. Daniel Craig’s first foray as James Bond tells the story of how he became a 00 agent. It all kicks off with his attempt at thwarting the known terrorist financer, Le Chiffre, after this villain tries to recoup the money lost by a Ugandan warlord amidst Bonds previous meddling. To the dismay of everyone present at the casino -- based, of course, in Montenegro -- Le Chiffre sets up a high stakes poker game to the sum of $10 million. Yet unfortunately for Bond he finds himself let down by his skills and is out of the game very early on. But fear not, soon after this happens an American named Felix graciously steps to one side and allows Bond to re-enter the game, doing so in a scene which involves spiked drinks, very attractive women, a bleeding eye, and enough sweat to sink the QE2. Bond naturally emerges victorious (as if we ever doubted it). At the start of this Oscar-winning film, we see the money grabbing Charlie Babbit (as played by Tom Cruise) learn that his dead father has left all of his wealth to a patient in a mental institution. Regrettably, Charlie is a pretty selfish person by nature, and so he takes it upon himself to travel to the institution to see if he can get this inheritance by hook or by crook. Problem is, the mental patient is none other than his long-lost brother, Raymond Babbit (as played by Dustin Hoffman), who suffers from Autism, a condition which strangely brings them both together on the road to Los Angeles. You see, hoping to swindle this money off of Raymond, the two of them take a road trip home, only to end up in a casino where Dustin Hoffman gives the performance of a lifetime. Raymond has a photographic memory, and I do mean photographic, and his brother Charlie soon takes advantage of this talent by instructing him to count the cards in a game of poker. Ops! Who's on first? Rounders focuses on the friendship between Mike (as played by Matt Damon) and Lester “Worm” Murphy (as played by Edward Norton) who, upon release from prison, is given five days to pay off his $15,000 debt. Feeling partially responsible for Murphy’s incarceration, Mike decides to help out his old friend by hitting the road in order to raise the cash needed. 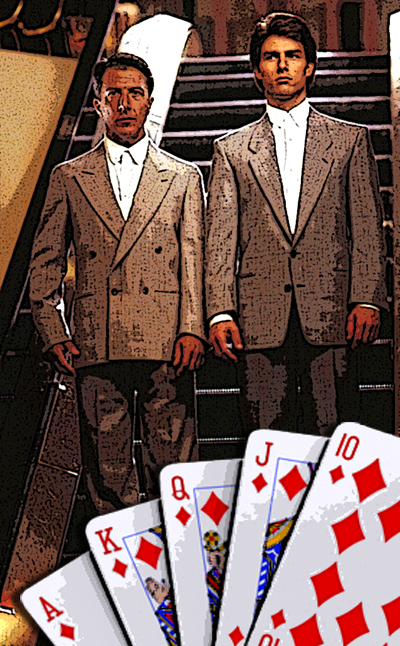 Now let's cut to the final scene where Mike is playing a card game against his arch nemesis, Teddy KGB (as played by John Malkovich), in a scene which is thrilling and intense due to the fact that Mike has the option to walk away after a successful first hand. But no. He doesn't walk away. Goaded by Teddy to continue he is nearly wiped out before spotting a ‘tell’, a 'tell' that leads to a loss, a win, a pay-off, plus a friend’s debt restored with the hope that he'll be able to get his own coffers in the process.